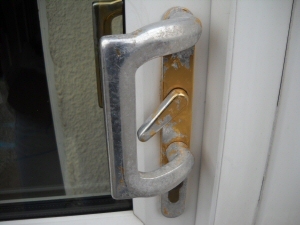 Example of worn UPVC door handle before replacement in Thornton CleveleysAs well as installing new Double Glazing, Soffits, Fascias and Guttering, J C Joinery offer repairs and replacement of UPVC windows, doors and their component parts. Replacement of failed units, such as steamed windows, whilst keeping your existing frames. Lock changes for a single window or door or all. New door and window handles, often without the need to change the lock. Ideal if they're faulty, the coating is scratched or you just want to change the colour. Rusted or faulty hinges replaced, including top, side or bottom opening mechanisms. Cat flaps removed and replaced with door panels. Repair of leaking UPVC guttering or pipework also available. With J C Joinery, you can be assured of UPVC Window and Door Repairs finished to a high standard, using quality materials and at a reasonable price.